It took nearly 7 hours but finally Zenit Arena has the natural turf in place. Weighing over 8,000 tons, the field was transported inside yesterday, during a day-long operation. Yesterday at 12:30 (am) the operation of field transfer began just outside Zenit Arena. 32 engines (16 pushing and 16 pulling) set the huge field of play in motion until, bit by bit, it travelled 200 meters up north, exactly inside the 68,000+ auditorium. The operation was ran by 18 workers and lasted until 19:15. On a regular basis it won’t be as time-consuming of course, but yesterday observations and tests had to be ran. Since completion in 2015, the field plate was only moved a bit to test if all engines operate properly. When evaluation is complete and the plate will operate properly, it’s expected to take only 6 people and 40 minutes to move the turf inside/out. Now the natural turf (120x80m) will rest inside for four days as its status is observed. by end of this week it will be moved outside again, to the southern foreground of Zenit Arena. Here the grass will be protected for wintertime and wait until January. Then the under-soil heating will begin to work in order to prompt growth before stadium opens in March, 2017. The stadium at Krestovskiy Ostrov is Russia’s first to have a sliding field. It’s also the world’s largest one to use such system. Even though the first movable field was installed back in 1990s, such technologies are still very uncommon, particularly due to their price. 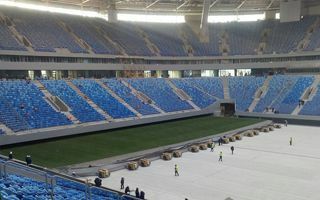 In Saint Petersburg the sliding field will both improve grass growth in natural light and allow for the fully enclosed stadium to hold non-sporting events without damaging the grass.